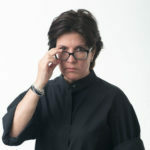 Tech platforms are largely unprepared for their enormous responsibility, which will affect every industry, including real estate, journalist Kara Swisher said during her opening talk at the Capital Connect portion of the Inman Connect San Francisco conference on Friday morning. Swisher, one of Silicon Valley’s most prominent journalists and the founder of the tech news site Recode, took the stage wearing her trademark sunglasses, where she was interviewed by Audie Chamberlain, founder of the real estate public relations firm Lion & Orb. Facebook, while an essential tool for many in the real estate industry, has faced growing scrutiny and criticism over the past two years. The platform was used by Russians to influence the 2016 U.S. presidential election, faced Congressional inquiries over its failure to protect data privacy in its Cambridge Analytica scandal and most recently saw founder Mark Zuckerberg say he would allow Holocaust deniers to share their views on Facebook in an interview with Swisher herself. “It’s a really complicated and difficult issue and unfortunately it’s being decided by a guy who didn’t finish college,” Swisher said. Most of Swisher’s conversation at ICSF focused on the tech industry more broadly, but Swisher did say she sees a lot of potential for the use of augmented reality and virtual reality in the real estate industry. Swisher also discussed the impact of data privacy and behemoths like Google owning information about millions of people for decades. “If you think of the applications for real estate, it’s enormous,” she said. As these platforms continue to figure out their responsibility in policing hate speech and incitements to violence and as facilitators of much of the world’s communication, their presences in people’s lives are changing. “Twitter has made a cesspool of itself. It’s a noisy, nasty cesspool now,” Swisher said. “Facebook has been a suburb so long, a really nice suburb, and suddenly, there’s glass windows that have been banged out, and suddenly, there’s people screaming at you,” she added. And for real estate agents, the implications of that are in advertising. “It’s a harder and harder place to market,” she said. Swisher said she almost missed the opportunity to interview Zuckerberg because he personally reached out to her through Facebook Messenger — a platform she doesn’t check. “Who the hell uses Messenger? Not me,” she said.